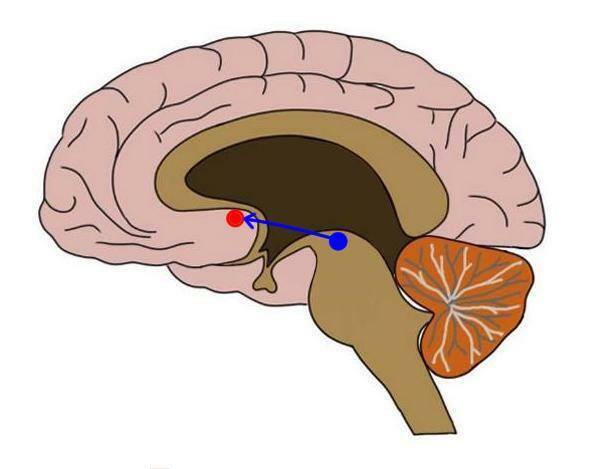 the connection between the ventral tegmental area (blue dot) and nucleus accumbens (red dot) that is a major part of the mesolimbic dopamine pathway. major dopamine pathway that begins in the ventral tegmental area and connects the nucleus accumbens, amygdala, hippocampus, and prefrontal cortex. The mesolimbic pathway is thought to be especially important to mediating pleasure and rewarding experiences.